As you will discover in the pages that follow (or as you may already realize), these years from ages three to six are busy, hectic ones for young children—and for their parents and caregivers. Preschoolers are physically active and energetic; researchers tell us that human beings have more physical energy at the age of three than at any other time in their life span—certainly more than their weary parents. Their inborn drive for emotional, cognitive, and physical development is urging them to explore the world around them; they’re acquiring and practicing social skills and entering the world outside the protected haven of the family. And preschoolers have ideas—lots of them—about how that world should operate. Their ideas, along with their urges to experiment and explore, often do not mesh with their parents’ and caregivers’ expectations. It’s probably safe to say that what you will discover in the chapters ahead is a bit different from what you grew up with. You will discover concepts such as kindness and firmness at the same time and looking for solutions with your child. You will learn about the importance of teaching social and life skills. And you will learn how essential it is to view parenting as a long-term commitment, rather than a series of crises and questions. You may even wonder what happened to “good old-fashioned discipline.” What would Dr. Benjamin Spock (or Grandma) think of all this? Positive Discipline is based on the work of Alfred Adler and his colleague Rudolf Dreikurs. Adler was a Viennese psychiatrist and a contemporary of Sigmund Freud—but he and Freud disagreed about almost everything. Adler believed that human behavior is motivated by a desire for belonging, significance, connection, and worth, which is influenced by our early decisions about ourselves, others, and the world around us. Interestingly, recent research tells us that children are “hardwired” from birth to seek connection with others, and that children who feel a sense of connection to their families, schools, and communities are less likely to misbehave. Adler believed that everyone has equal rights to dignity and respect (including children), ideas that found a warm reception in America, a land he adopted as his own after immigrating here. Rudolf Dreikurs, a Viennese psychiatrist and student of Adler’s who came to the United States in 1937, was a passionate advocate of the need for dignity and mutual respect in all relationships—including the family. He wrote books about teaching and parenting that are still widely read, including the classic Children: The Challenge. As you will learn, much of what many people mislabel as “misbehavior” in preschoolers has more to do with emotional, physical, and cognitive development and age-appropriate behavior. Young children need teaching, guidance, and love (which is a good definition of Positive Discipline). Positive Discipline is effective with preschoolers because it is different from conventional discipline. It has nothing to do with punishment (which many people think is synonymous with discipline) and everything to do with teaching valuable social and life skills. Discipline with young children involves deciding what you will do and then kindly and firmly following through, rather than expecting your child to “behave.” As your child matures and becomes more skilled, you will be able to involve him in the process of focusing on solutions and participating in limit setting. In this way he can practice his thinking skills, feel more capable, and learn to use his power and autonomy in useful ways—to say nothing of feeling more motivated to follow solutions and limits he has helped create. The principles of Positive Discipline will help you build a relationship of love and respect with your child and will help you solve problems together for many years to come. · Mutual respect. Parents model firmness by respecting themselves and the needs of the situation, and kindness by respecting the needs and humanity of the child. · Understanding the belief behind behavior. All human behavior has a purpose. You will be far more effective at changing your child’s behavior when you understand the motivation for it. (Children start creating the beliefs that form their personality from the day they are born.) Dealing with the belief is as important as (if not more important than) dealing with the behavior. · Effective communication. Parents and children (even young ones) can learn to listen well and use respectful words to ask for what they need. Parents will learn that children “hear” better when they are invited to think and participate instead of being told what to think and do. And parents will learn how to model the listening they expect from their children. · Understanding a child’s world. Children go through different stages of development. By learning about the developmental tasks your child faces and taking into account other variables such as birth order, temperament, and the presence (or absence) of social and emotional skills, your child’s behavior becomes easier to understand. When you understand your child’s world, you can choose better responses to her behavior. · Discipline that teaches. Effective discipline teaches valuable social and life skills and is neither permissive nor punitive. · Focusing on solutions instead of punishment. Blame never solves problems. At first, you will decide how to approach challenges and problems. But as your child grows and develops, you will learn to work together to find respectful, helpful solutions to the challenges you face, from spilled Kool-Aid to bedtime woes. · Encouragement. Encouragement celebrates effort and improvement, not just success, and helps children develop confidence in their own abilities. · Children do better when they feel better. Where did parents get the crazy idea that in order to make children behave, parents should make them feel shame, humiliation, or even pain? Children are more motivated to cooperate, learn new skills, and offer affection and respect when they feel encouraged, connected, and loved. Do these parents’ words sound familiar? When people talk about “discipline” they usually mean “punishment” because they believe the two are one and the same. Parents and teachers sometimes yell and lecture, spank and slap hands, take away toys and privileges, and plop children in a punitive time-out to “think about what you did.” Unfortunately, no matter how effective punishment may seem at the moment, it does not create the long-term learning and social and life skills parents truly want for their children. Punishment only makes a challenging situation worse, inviting both adults and children to plunge headfirst into power struggles. Positive Discipline is based on a different premise: that children (and adults) do better when they feel better. Positive Discipline is about teaching (the meaning of the word discipline is “to teach”), understanding, encouraging, and communicating—not about punishing. Most of us absorbed our ideas about discipline from our own parents, our society, and years of tradition and assumptions. We often believe that children must suffer (at least a little) or they won’t learn anything. But in the past few decades, our society and culture have changed rapidly and our understanding of how children grow and learn has changed, so the ways we teach children to be capable, responsible, confident people must change as well. Punishment may seem to work in the short term. But over time, it creates rebellion, resistance, or children who just don’t believe in their own worth. There is a better way, and this book is devoted to helping parents discover it. There is a difference between wants and needs, and your child’s needs are simpler than you might think. All genuine needs should be met. But when you give in to all of your child’s wants, you can create huge problems for your child and for yourself. For example, your preschooler needs food, shelter, and care. He needs warmth and security. He does not need a pint-sized computer, a television in his bedroom, an iPod, or a miniature monster truck to drive. He may love staring at the television screen, but experts tell us that any kind of screen time at this age may hamper optimal brain development. (More about this later.) He may want to sleep in your bed, but he will feel a sense of self-reliance and capability by learning to fall asleep in his own bed. He may love french fries and sugary soda, but if you provide them you could be setting the stage for childhood (and adult) obesity. You get the idea. If you can provide your child with these needs, he will be well on his way to becoming a competent, resourceful, happy human being. “Well, of course,” you may be thinking, “everyone knows a child needs to belong.” Most parents believe that what a child really needs is quite simple: he needs love. But love alone does not always create a sense of belonging or worth. In fact, love sometimes leads parents to pamper their children, to punish their children, or to make decisions that are not in their child’s long-term best interest. Everyone—adults and children alike—needs to belong somewhere. We need to know that we are accepted unconditionally for who we are, rather than just our behavior or what we can do. For young children, the need to belong is even more crucial. After all, they’re still learning about the world around them and their place in it. They need to know they are loved and wanted even when they have a tantrum, spill their cereal, break Dad’s golf clubs, or make yet another mess in the kitchen. Children who don’t believe they belong become discouraged, and discouraged children often misbehave. Notice the word believe. You may know your child belongs and is significant. But if he doesn’t believe it (sometimes for the darnedest reasons, such as the birth of another baby), he may try to find his sense of belonging and significance in mistaken ways. In fact, most young children’s misbehavior is a sort of “code” designed to let you know that they don’t feel a sense of belonging and need your attention, connection, time, and teaching. When you can create a sense of belonging and significance for every member of your family, your home becomes a place of peace, respect, and safety. Your preschooler will never learn to make decisions, learn new skills, or trust his own abilities if you don’t make room for him to practice. Parenting in the preschool years involves a great deal of letting go. You will learn more in the chapters ahead about encouraging perceptions of capability in your child, but for now, consider this: words alone are not powerful enough to build a sense of competence and confidence in children. Children feel capable when they experience capability and self-sufficiency—when they are able to successfully do something—and from developing solid skills. Part of your job as a parent will be to help your child learn to channel his considerable power in positive directions—to help solve problems, to learn life skills, and to respect and cooperate with others. Punishment will not teach these vital lessons: effective and loving discipline will. Teaching your child skills—how to get along with other children and adults, how to feed and dress herself, how to learn responsibility—will occupy most of your parenting hours during the preschool years. But the need for social and practical life skills never goes away. In fact, true self-esteem does not come from being loved, praised, or showered with goodies—it comes from having skills. When children are young, they love to imitate parents. Your child will want to hammer nails with you, squirt the bottle of bathroom cleaner, and cook breakfast (with lots of supervision). As he grows more capable, you can use these everyday moments of life together to teach him how to become a competent, capable person. Working together to learn skills can occasionally be messy, but it’s also an enjoyable and valuable part of raising your child. 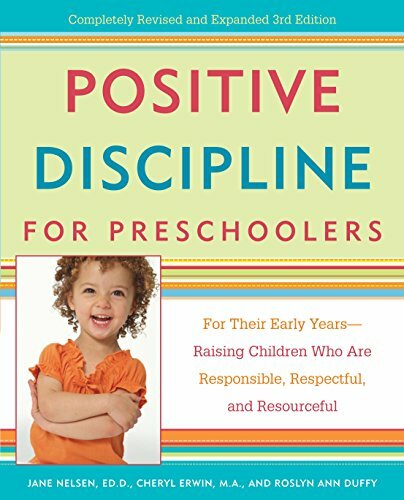 Completely updated to report the latest research in child development and learning, Positive Discipline for Preschoolers will teach you how to use methods to raise a child who is responsible, respectful, and resourceful. Caring for young children is one of the most challenging tasks an adult will ever face. No matter how much you love your child, there will be moments filled with frustration, anger, and even desperation. There will also be questions: Why does my four-year-old deliberately lie to me? Why won’t my three-year-old listen to me? Should I ever spank my preschooler when she is disobedient? Over the years, millions of parents just like you have come to trust the Positive Discipline series and its commonsense approach to child-rearing.